It is sometimes hard to trace a clear difference between men and animals, not to talk about the – by somebody supported – thesis of the superiority of the first on the latter in the everyday life. This is true especially if we take in consideration the history of the First World War. Especially during wars, all optimistic anthropocentric attitudes are questioned insofar we often witness such a brutalizing of human beings that they seem to turn into beasts, more ferocious and stupid than animals usually are (and we do not need to list some examples to explain what we mean, just turn on the television or read a newspaper). Yet, in extreme situations such as the Great War the distinction between them seems to dwindle in another way: men and animals cooperated providing each other both a physical and an emotional support. Sharing the common effort to survive the destructive force of the conflict, they became co-protagonists of the history, as if the natural dynamics, to which each of them reacts, could overlap in the tiny space of a trench or in the epic scenario of the battlefield. Let's think for example at the deep relationship soldiers developed towards their horses, or the unexpected comfort that pets or mascots - among others cats - provided to the men in the trenches or in the military camps behind the front line (have a look to this photo, the tender caress of a soldier on a fox). And yet, their cooperation in wartime can not even be reduced to a peaceful and idyllic coexistence; it preserved on the contrary a potential tension. Animals were often just utilized for immediate military requirements (we've already recalled the example of pigeons and dogs) and sacrificed to the final victory (a fate they shared with the simple soldiers, just think about some pictures took on battlefield after a defeat of a cavalry troop). They provided the nourishment to the troops which occupied new territories. And again, men and animals engaged also a "war in the war": rats and mice plagued soldiers' lives, not to talk about the smaller insects hovering or buzzing in and around the trenches. In short, the connection between animals and men during the Great War was much nuanced, and it deserves probably more attention than it had up to now. 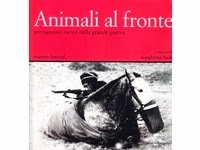 We guess that Eugenio Bucciol had this in mind as he wrote his wonderful book Animali al fronte (Animals on the frontline), edited by Nuova Dimensione in 2003. The reader can for sure find today many works dealing with the topic, but we have to admit that the volume by Bucciol has a "plus". Focusing on the "animal perspective", he tries to write a "parallel history" of the Great War, telling us the story of all the creatures, great or small, that took part in the conflict. The first chapter of the volume provides the reader a short survey of the "unknown" protagonists of the Great War. We meet so horses, mules and donkeys, who provided the quickest form of transport and remained the primary source of power needed to transport guns to and from the front line; and then dogs and pigeons, which we have already mentioned; then animals - such as pigs and cattle - used to nourish the army (the Author discusses some episode related to the Austro-Hungarians in the Venetian region after the rout of Caporetto), and finally the parasites. It is however the second chapter that offers very interesting and touching sources and represents the "plus" of this volume, since it is made up of a large collection of pictures, most of them the Author collected in the Austrian War Archives in Vienna, where Bucciol lived for a long time. The photographic materials are arranged according to a "geographic distribution": the Italian Front, the French Front, the Russian and the Galicia Front, that of the Ottoman Empire and of the German and Austro-Hungarian territories. Leafing through this section the reader is kept in a whirlwind not only of images but also of emotions, which cannot easily put in order; yet because of that he can get a vivid impression of the history of the Great War, as if it was told us by the animals. The reach photographic material makes this work usable by everybody, no matter which is the mother-language.